Justin Kauflin is rapidly making a name for himself as one of the most promising young musicians on today’s jazz scene. The talented pianist first gained major exposure through Keep on Keepin’ On, a documentary that told of Kauflin’s honest and pure relationship with his greatest mentor, the late trumpeter Clark Terry. 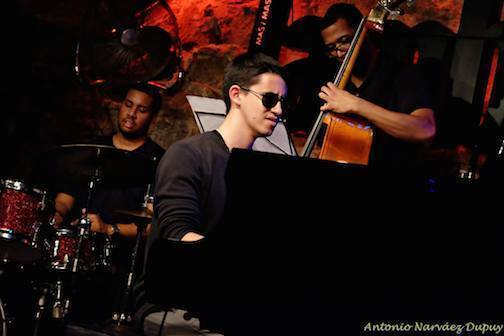 Last month, Kauflin completed his second 2015 European tour, during which he presented his latest album, Dedication (Jazz Village, 2014), produced by Quincy Jones. The Justin Kauflin Trio, with Chris Smith on bass and Billy Williams on drums, captivated the audience with the perceptible spiritual energy that lights Kauflin’s compositions and the band’s ability of to explore contemporary language and intense rhythm. We spoke with Kauflin during his stop in Barcelona. 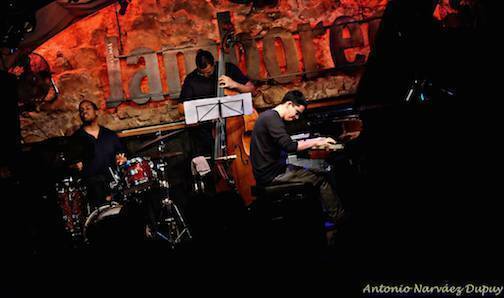 Your name is gaining recognition in the international jazz scene. That must feel gratifying. I hate to get ahead of myself [smiles]. If things continue to develop in a positive direction, I would of course be thrilled with that. Right now, I’m simply grateful to have this incredible opportunity to get out there and share some music and positive vibes with all sorts of new music lovers from all over. I’ll be happy to continue on this ride wherever it may take me. Yours is a story of hard work, overcoming life obstacles and good luck getting to meet and profoundly connect with your mentor, Clark Terry. How would you describe your path before and after meeting him? Before meeting Clark, while attending William Paterson University, I already had a good idea that pursuing a career in jazz was the thing for me. Getting to know Clark helped put things in perspective. I quickly realized that developing a career in jazz is not just about perfecting one’s musical craft, but like most things in life, it’s more about people and community. Spending time with CT allowed me to see the human side of being a great performer/musician/educator. He was the true embodiment of a consummate musician. Now, I make it point to cultivate relationships with all those with whom I come in contact. I will always strive to grow as a musician, but I now understand how much more important it is to develop and grow as a human being. You embrace tradition-it can be heard in your phrasing and can be felt through the emotions you transmit to the audience-but you are engaged in the contemporary jazz language as well. Do you think you are finding your own voice? I’m so glad you recognize that in my playing. This is something I spend quite a lot of time contemplating. I have a deep love and passion for the tradition and history of this music. I’ll forever be assimilating more and more of the jazz tradition in my sound. There is just so much material and language to be learned. At the same time, I have always been excited to see how we as a community move the tradition forward. If I’m being honest with myself, there is a lot of music outside of traditional jazz that I’ve been drawn to. I can’t just ignore that part of my musical identity. So, the modern approach to jazz will be another facet of my musical exploration. Marrying these two approaches will be something I hope to realize with more clarity as I grow. Through this, I trust that my voice will continue to develop and emerge as something recognizable. In your last album, Dedication, you use two different formats, trio and quartet. Why did you mix these different sonorities? I actually varied it between quartet, trio and solo. I wrote much of the music to feature a guitar lead voice for the melodies. I simply love the new harmonic and textural possibilities that the quartet presents as opposed to the piano trio format. With that said, I enjoy the intimacy and more compact sound of the trio. So, I incorporated both while programming the CD. I love to have sonic variety when presenting my material. Another thing I explored to a lesser degree was the use of synthesizers on some of the tracks. I’m finding more and more that this is a device I look forward to utilizing to a greater extent as I write and arrange new material for the future. What do you think guitar, another harmonic instrument, provides to your compositions? The guitar frees me up considerably to orchestrate in new ways. I’m freed up from the responsibility of always playing the melody, so I can find out new ways to fill in the cracks harmonically and rhythmically speaking. And, it definitely didn’t hurt to have such a powerful and well-defined voice like Matthew Stevens on the guitar. He has such a strong presence in his approach, and I loved being able to play behind and be inspired by it. What would you say is the main evolution between your first CD and this one? I feel there are two major differences between Introducing and Dedication. The first was the intent. When preparing to record my first album, I didn’t necessarily have an overall concept for the project. It was merely a vehicle for sharing many things I was into at the time. When I decided to record Dedication, I had a very clear picture of what I wanted to accomplish even before much of the music had been composed. I knew that Dedication was going to be a collection of tributes to the people and ideas most influential to me. The other major difference was that I wanted to focus more on the inspiration for the compositions on Dedication. When I wrote “For Clark” or “The Professor” for Mulgrew Miller, I wanted the focus to be on them, not on a whole lot of blowing. The tracks on Dedication are perhaps more concise because of this. Your music is so evocative. Where does all the light that fills your compositions come from? The “light” for everything in my life comes from my Catholic faith and relationships with God and with all of the people I’m blessed to know. Without this, my music would mean nothing to me. You have just finished your second 2015 European tour with your trio. How was the audience response? The audience response over in Europe has been overwhelmingly positive. It has been so gratifying to come over and share something so personal with new audiences and to receive such a warm reception. I cannot wait to be back to share more stories and music next time. 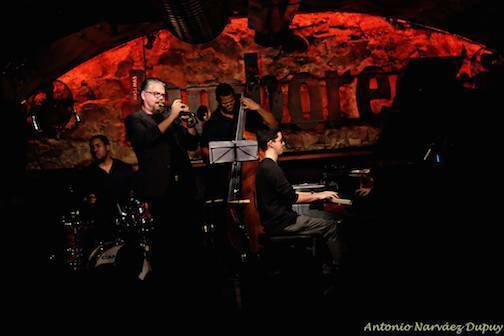 On this tour, in Barcelona, you played at the emblematic Jamboree Jazz Club, where you invited the accomplished trumpeter David Pastor to play with you. How was the experience of having him guest with your band? Currently, I’m traveling around the United States performing with some good friends of mine. I’m also enjoying having a little time off to get back to the drawing board to see what my next musical venture might involve.